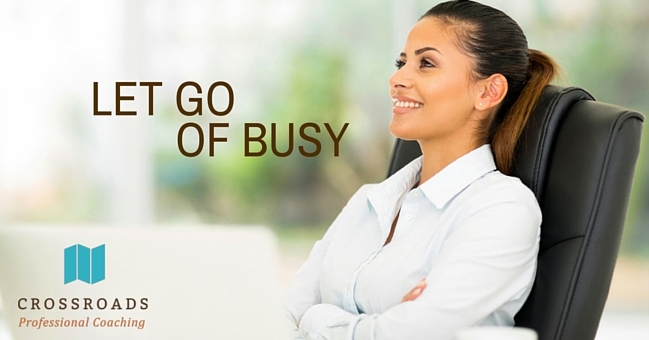 Most people you speak to claim “busy” as a core descriptor of how they are. It’s interesting because “busy” does not usually answer the question to the satisfaction of the asker, who may have truly been interested in the state of your well-being, mentally, spiritually, or even physically. Yet, “busy” is often how this question is answered. As we age, busyness may keep the same definition, as far as the number of plates we are spinning, but the application of busyness to our personal well-being changes dramatically over time. In my 20’s, busy meant fun and adventure. In my 30’s, busy connotated a growing family and balancing it with work. In my 40’s, busy was sharing my faith, growing my business, and deepening my relationships. Now it is the decade of my 50’s. Busy to me is boring. Busy is stressful. Busy is the opposite of purposeful. If busy in my 50’s was an emoji, it would surely be a frowning face. Relinquishing busy from our descriptors is more difficult in the first half century of life, but it shouldn’t be. Letting go of busy makes room for better. Living life to the fullest requires energy and vitality, all more accessible with time and space. To truly experience the moments, the relationships, and the journey, I encourage you from a second half-century perspective to let go of busy, whatever decade you are in. I wish I could say I have managed it well, but it definitely comes and goes for me. What Does Too Busy Look Like? For example, I have been in a busy season for the past 6 months. Left without attention, it would just stay that way. But I have learned when I feel over-burdened, lacking in creativity, and missing the purpose in my days… I need to adjust. How to do that may not be an overnight transition, and I am sure it will come and go over the years for you too, but I do believe it is possible manage. Here are some tips I have learned through much trial and error. 1. Know thyself – understand what too busy feels like to you. Lack of energy and feeling tired a lot. Not enough time to spend quiet time with God. Short on patience with people. Going through the motions but not really enjoying your time. Feeling scattered and stressed often. The first step toward change is awareness. But, in the case of being always on the go, it is a deeper understanding of ourselves. When we are young we think of being on-the-go as living life to the fullest. We truly feel like we may miss out on something if we pass some things up. But, did you miss it anyway, even though you were there? The test of today’s culture may just be found on your social media pages. If you look at all of your Instagrams, Facebook photos, SnapChats, and such…did you have more fun, relaxation, or time with loved ones than the pictures depict? or less? I know people who can be in a bad mood and fighting, then paste on a smile, get a picture of the event they are at, and go right back to the bickering. Do you pass the Facebook challenge? 2. Accept that there are different seasons in life. One of the hardest things in life is to accept our season. When we are single, we want a significant other. When we are working, we wish we could spend more time with family. When we have kids, we remember the times we could get up and go on a whim. Without kids, we secretly covet the squishy little babies popping out of all of our friends. We want to do it all. There is a time for everything under the sun according the wisest King of all, Solomon. We just need to slow down enough to truly experience them all. Think about your current season of life. Where should your time be focused? What should the priorities be? Pray about letting go of past priorities and accepting this season of your life. Our mindset is an important step in letting go of busyness. 3. Visualize your life with optimal joy. Joy is a subjective term. Since our time on earth is limited, and according to Jesus, we should prioritize loving Him and loving others, we have some built-in guidelines. I have energy and feel good. I have enough time to be and stay in the moment. (When I have too much going on and so many things to do, I am constantly looking to what I have to do to ready myself for the next thing.) The next thing is the thief that takes away the now. I am able to connect with the people I am with. 4. Determine what has to change. Where is the gap? It is easier to focus on what we need more of or less of, to let go of busyness, than it is to start from scratch. For example, you may need more sleep, more exercise, less work, and less activities. Something I do frequently from season to season is a time allocation. I break up how much time I am spending on various aspects of my life into percentages of the pie. Then I develop the pie I want to be enjoying. Where do I want my time to be? It is usually easier to create the transition to the new time allocation if you focus on the easiest or smallest gap to conquer. 5. Develop a plan to start the shift. Change isn’t usually easy. Especially when busyness is seeded in our culture. It is more than a series of activities, it is also a state of mind. The best proof that a less-busy life is better, is getting to it. Nothing proves the message like memories that last in our minds, not just our photos. Nothing can prove the value like deeper relationships and time with the people we love. Nothing can compare to spending time with our Savior and living the life He has planned for us. Whatever decade you are in, step back and evaluate what emoji you would assign to your busyness. And move toward a slower, yet better, life. Sue what a great article. Love the way you articulated that better is more important than busy and what we miss out on not having this mind set. Keep those great articles coming! Love them all! Fantastic article and message. Thank you for sharing your thoughts and ideas.